Spicy Frozen Cucumbers are God’s Gift to the cucumber rich and pickle weary. Spicy Frozen cucumbers are what you do when you still have cucumbers and cannot possibly entertain the idea of making more pickles. Believe it or not (!) they come out crispy– that’s on account of the fact that they were frozen and you eat them before they are fully defrosted. We’ve made two double batches (i.e., double the recipe below) yielding eight plastic freezer containers of two cups each. Pictured above is what the cucumbers look like as they await disbursement into the freezer containers. 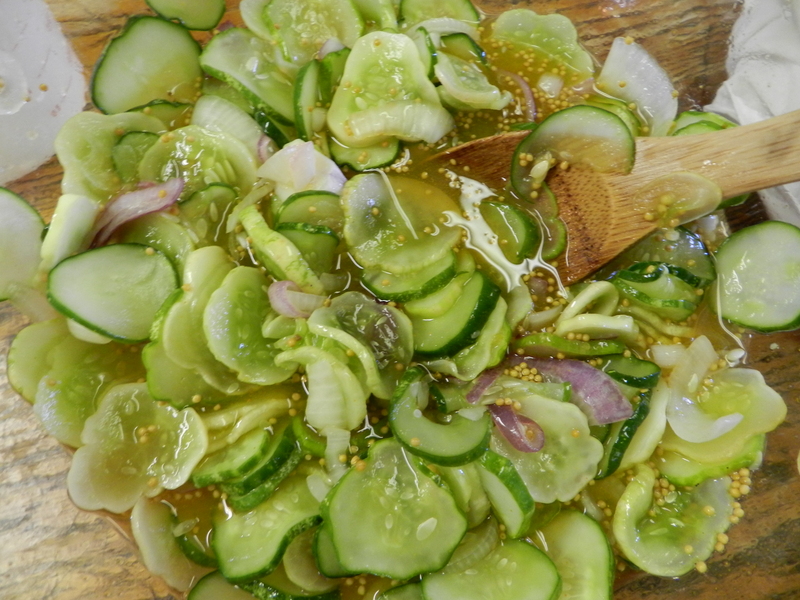 Combine cucumbers, onions, and salt in a glass or ceramic bowl, and let stand 2 to 4 hours to extract moisture. Rinse and drain vegetables well, blotting with paper towels to absorb all moisture. Combine sugar, vinegar, turmeric, and mustard seeds, and mix well until the sugar dissolves completely, about 10 minutes. Stir in vegetables carefully. Pour cucumber mixture into clean freezer containers, leaving 1 inch headspace for expansion. Cap, seal, and freeze. “These will keep up to 1 year in freezer.” To use, thaw about 4 hours in the refrigerator. Serve chilled.